Brando has advanced settings panel for page settings. Page options will give you full control over page design and customize it without adding single line of code. A Page option includes Layout, Header, Page Title, Comments and Footer settings. 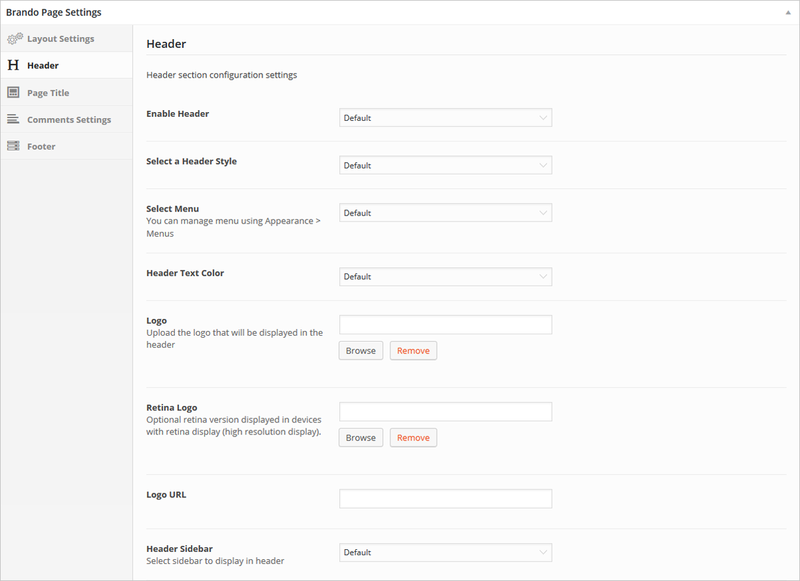 Navigate to Pages > Add/Edit Page > Brando Page Settings > Layout Settings from admin panel’s sidebar. 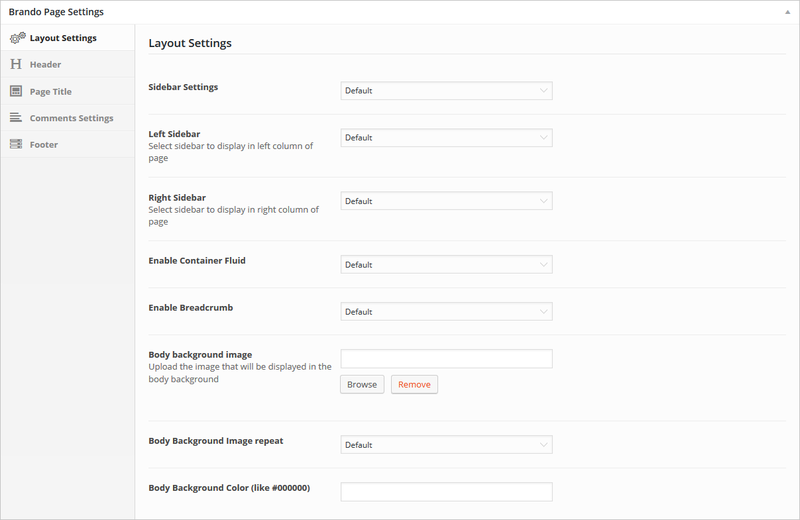 It includes page sidebar settings, left or right sidebar selection, container fluid, breadcrumb, body background image, body background image repeat, body background color. Navigate to Pages > Add/Edit Page > Brando Page Settings > Header from admin panel’s sidebar. It includes enable/disable header, header style, menu, text color, logo, logo url, footer sidebar. Navigate to Pages > Add/Edit Page > Brando Page Settings > Page Title from admin panel’s sidebar. Enable/disable title, subtitle, title background image and parallax effect. Navigate to Pages > Add/Edit Page > Brando Page Settings > Comment Settings from admin panel’s sidebar. Enable/disable comments section on page. 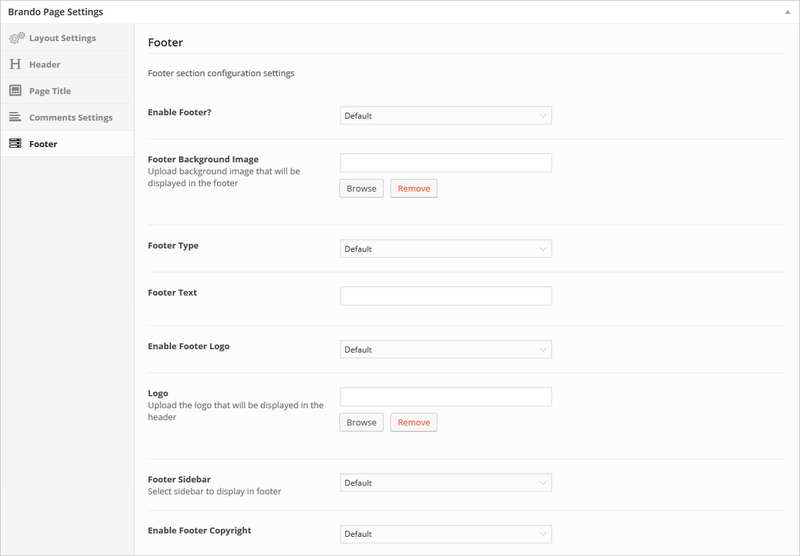 Navigate to Pages > Add/Edit Page > Brando Page Settings > Footer from admin panel’s sidebar. Enable/disable footer, Footer background image, footer type, footer text, footer logo, footer sidebar and footer copyright.